For a laid back but still stylish beach wedding attire for men, combine a pair of tailored (as opposed to more casual draw string) white linen pants, a crisp tailored shirt (striped will look very nice or else something like the white shirt featured in the picture above with the blue and purple checkered and paisley cuff and collar details). A tailored shirt hugs the body nicely and looks smarter than a regular fit. Complete the look with a white webbed belt and some sandals, white espadrilles or color coded deck shoes (like the blue Lacoste ones in the picture above). Wear the shirt with the collar open and the sleeves rolled up. Finish the look with a white fedora hat or a panama hat. All of the items described above and seen in the picture can be seen in greater detail and bought online here. If getting married barefoot and in your baggies is not your idea of a wedding look, but you also don't want to be overdressed, then perhaps something relaxed, but still classic would work well for you. Try a simple pair of black linen pants with a tailored shirt in white or in your wedding colors. Choose a French cuff shirt with which you can wear some funky cufflinks like the barefoot cufflinks in the picture above. 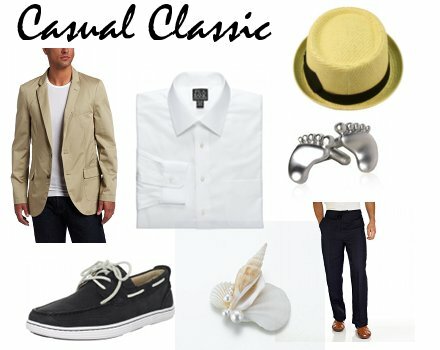 Wear the shirt with the lapel open and team with a beige summer blazer, black and white boat shoes and finish off the look with a natural, woven pork pie hat and a shell boutonniere. 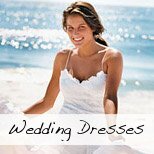 View prices for these items in the Beach Wedding Store. 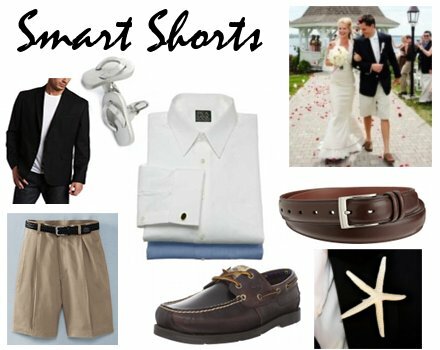 Another funky look that you might want to consider for a beach wedding if you want something a little different that is not overly formal and still gives that touch of light heartedness to the beach wedding attire for men, is to combine a pair of beige tailored shorts, a tailored white shirt and a dark summer blazer with deck shoes. You can wear this with or without a tie. Finish with a belt to match the shoes, beach wedding inspired cuff links (if you are wearing a suitable shirt) and a DIY starfish boutonniere. These can be easily made by gluing a real or beaded starfish to a brooch pin. I know it sounds a little strange, but it actually looks really nice and is in context with the theme of the wedding. The photo here is testament. Find these items in our Beach Wedding Store. 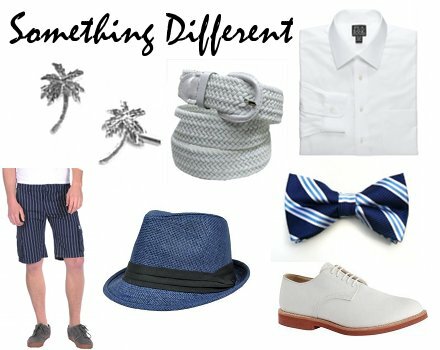 Or how about this for a eye catching grooms beach wedding attire selection: A pair of tailored, pin-stripe shorts, a white woven sailor's belt, a tailored white French cuff shirt, white derby shoes, a fun bow tie, palm tree cuff links and a textured straw trilby hat. Definitely something different! This suggestion is inspired by WellGroomedBlog.com This is a great blog full of inspirational styling advice for guys. If you are not really a guy for cuff links, hats and other accessories, but you still want to look like a million bucks at your beach wedding, then opt for minimal, but with style! 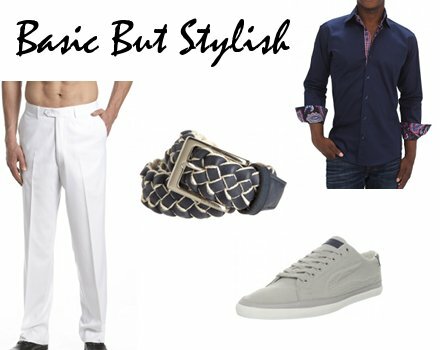 A look that is really nice, because it is so simple is to pair white linen slacks with a navy blue or black dress shirt (the funky one above is quite a statement with its cuff and collar details and tailored fit) Combine with a braided navy belt, boat shoes, tennis shoes or these canvas bocanas from Lacoste. Fresh, uncluttered and handsome! The look above is inspired by a real beach wedding as seen in the above right corner. 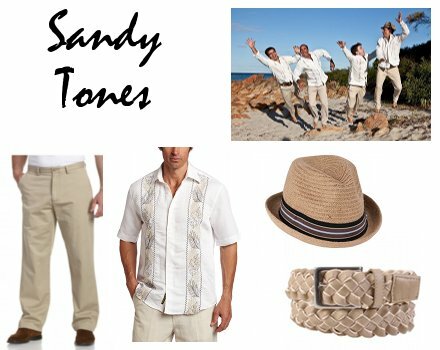 It uses sandy hues to combine a classic and understated beach wedding look for the groom and groomsmen. Combine a pair of chinos with a short or long sleeved white shirt with some embroidery detail, a woven sand or brown belt and a natural fiber trilby hat. Shoes optional! Find these items above in our online store. Another great look if you are having a sailing themed wedding or even just if one or both of you love sailing is the look set out in the picture above. Match some navy shorts with a crisp white dress shirt and a pinstripe sports jacket. 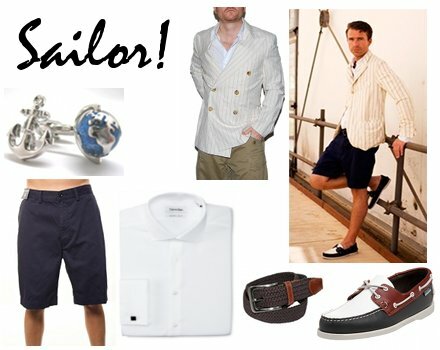 Complete the look with mulit-colored boat shoes, a braided, stretchable sailors belt and some sailing inspired cufflinks. Add a real sail boat as a venue for extra drama! 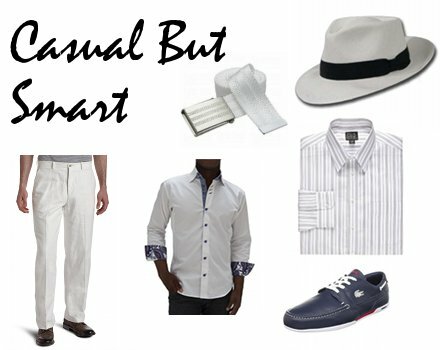 Buy Smart Casual Beach Wedding Attire For Men Here! Looking for something a little more formal? Have a look at our suggestions for Semi-Formal Beach Wedding Attire for Men Here! If you want a more relaxed and casual look, then also have a look at our page on Casual Beach Wedding Attire for the Groom. Also, don't forget to read the general tips and tricks on choosing your men's beach wedding attire.